So if you are a reader of this blog, chances are you already have some sort of propensity towards liking the subject material in physics regardless of it the immediate impact of the subject material at hand will “build the better mouse trap,” so to speak. Basically, by utilizing his understanding of angular and linear velocity Dmitri Krioukov of the University of California was able to lay out the argument that because of the police officers position and difficulty we have discerning linear velocity from angular velocity when observing from a distance perpendicular to the direction of motion the police officer mistakenly thought that Dmitri failed to stop at a stop sign. If you have been near a railroad track crossing when a train is coming you’ve likely experienced this. Often when the crossing gates come down you look down the track and see a train in the distance that appears to be approaching very slowly. As the train gets closer is seems to be speeding up until it passed directly in front of you when it seems to have reached maximum speed. Of course the truth of the matter is that the linear speed of the train is constant, while what you are observing is the angular speed which gives you the illusion that the train was moving slower and then accelerating as it comes closer. 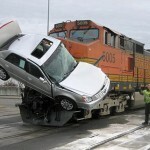 This is in fact one of the reasons car accidents occur when cars attempt to “beat” a train across the tracks. We are really bad at estimating the actual speed of the train and thus the train appears to “speed up” and cross the tracks much quicker then we anticipate. 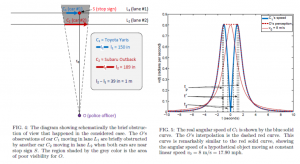 We show that if a car stops at a stop sign, an observer, e.g., a police officer, located at a certain distance perpendicular to the car trajectory, must have an illusion that the car does not stop, if the following three conditions are satisfied: (1) the observer measures not the linear but angular speed of the car; (2) the car decelerates and subsequently accelerates relatively fast; and (3) there is a short-time obstruction of the observer’s view of the car by an external object, e.g., another car, at the moment when both cars are near the stop sign. What I found so great about this is that using little more then simple geometry and basic kinematics he convincingly argues how this easy mistaken can be made and using simple (and rather well drawn) graphs makes his compelling argument. Finally, i am left with a serious example that is easy to follow and according to the Wired UK source resulted in the defendant not having to pay the $400 ticket. So for all those non-physics people that somehow found their way onto this blog….STUDY YOUR KINEMATICS! It may just save your driving record.